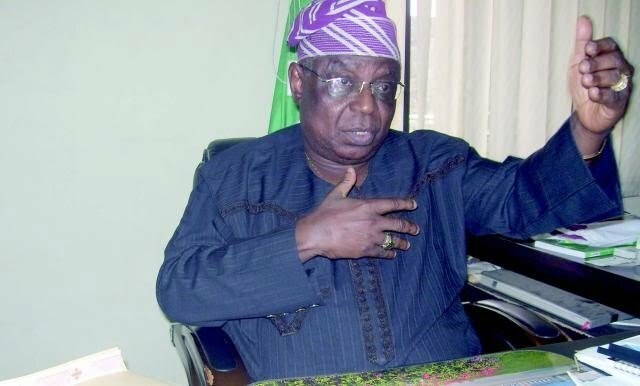 Chairman of the All Progressives Congress, APC, in Lagos State, Chief Henry Ajomale has said inciting statement by the Peoples Democratic Party towards President Muhammadu Buhari is as a result of his anti-corruption war. Ajomale speaking on herdsmen killings in Benue and Taraba said Buhari was being made a scapegoat as killings took place during Olusegun Obasanjo and Goodluck Jonathan’s administration. He stated that there was no basis of comparison between both prominent parties as PDP was darkness while APC was light to Nigeria. According to him, PDP members were trying to demonise Buhari because of his anti-corruption war, adding that 16years of PDP in power were years of waste and locust. He said “It is very unfair to make President Buhari a scapegoat over these killings. These killings have been taking place before Buhari assumed office. The killings took place when Obasanjo was there, it took place when Yar’Adua was there and it took place during the time of former President Goodluck Jonathan. “I believe some Nigerians are just being mischievous especially PDP members and their apologists. They are just looking at any way to get back at Buhari because of the ongoing anti-corruption war which has affected many PDP members. It is corruption fighting back. When somebody now sneezes or cough it is Buhari. It is these looters and enemies of the anti-corruption war that are behind the smear campaign against Buhari. “Like I said earlier, to forestall further killings and in order to restore peace to the affected communities, the President had ordered security agencies to secure the affected areas to prevent further destruction and loss of lives. “Since he assumed office, Buhari has been trying his best to tackle various socio-economic challenges facing Nigeria, but some Nigerians are not comfortable with his anti-corruption war and this is why some of them are deliberately destroying the man’s name – this is why they are trying to demonise him. But Buhari and APC will not be distracted by these few disgruntled elements as the president and APC have a mission to fulfil. “APC is on a rescue mission and that mission is to salvage Nigeria. Sixteen years of PDP’s rule of Nigeria were years of waste. They were years of the locust. “But the PDP has been boasting that Nigerians can now see that things were not this bad when it was in power, how do you react to that? “It is unfortunate that these PDP leaders can still have courage to be speaking in public. Was it not under the yoke and burden of 16 years of PDP in power that Nigeria almost became bankrupt? Nigeria would have by now become a failed state if PDP and Jonathan were still there. “Unlike now when Nigerians are more secured, Boko Haram was having a field day during Jonathan’s era, bombings became a daily occurrence. It became so worst that Boko Haram suicide bombers bombed Police Headquarters in Abuja; they bombed United Nations’ office also in Abuja. At a point, Boko Haram suicide bombers almost stormed Aso Rock. No Nigerian was safe. It is unfortunate that these PDP leaders talking now and some Nigerians have short memory. “There is no basis for comparison between APC and PDP at all. PDP is darkness and APC is light, and that’s why more Nigerians embrace APC. Was it not under Jonathan’s watch that almost 300 Chibok girls were abducted? Jonathan and PDP’s government at the time became so ineffective to the extent that Jonathan’s government was described as clueless,” he told Sun.